Protesters shut down an intersection outside an ICE detention center in California to demand an end to the inhumane treatment of trans and queer immigrants. Dozens of trans and queer protesters shut down an intersection outside an Immigration and Customs Enforcement detention center in Santa Ana, California early on May 28 in order to demand an end to the inhumane treatment of immigrants, particularly trans and queer immigrants. The protesters gathered at Flowers Street and Civic Center Drive at around 8 a.m., where they formed a triangular human chain linked to a metal cage in the center of the intersection. The ICE detention center they protested near is known for holding queer and trans detainees. Some of the activists were wrapped in metal chains representing the conditions under which many trans and queer immigrants are detained by ICE. Once the intersection was blocked, the protesters sat-in, chanted and demanded an end to detention and deportation of immigrants. They also demanded that the city of Santa Ana end its contract with ICE. The demonstration, organized by the #Not1More Campaign, Familia: Trans Queer Liberation Movement, and GetEQUAL, also resulted in the arrest of five protesters. Activists Isa Noyola, Mar Martinez, Paolo Jara-Riveros, Jiselle Oneel, and Jorge Hernandez were all arrested by Santa Ana police while sitting, wrapped in chains, in the intersection and refusing to move. They were then booked at the Orange County jail, charged with obstruction and failure to disperse, and held in lieu of $500 bail. “They have a right to speak their opinions, however, they don’t have a right to take over the middle of a busy intersection,” Santa Ana Police Cpl. Anthony Bertagna told ABC7. The protesters cheered their comrades as they were arrested, and afterwards, marched to the police station while chanting, dancing, waving rainbow flags and shooting confetti cannons. They vowed to stay outside the police station until the arrestees were free. Bail was soon collected by the activists, and the five arrestees were free before the next day. “ICE is committed to upholding an immigration detention system that prioritizes the health, safety and welfare of all of those in our care in custody, including lesbian, gay, bi-sexual and transgender individuals,” the statement continued. But a 2014 investigation by Fusion showed that the vast majority of trans detainees are trans women placed in male detention centers, an unhealthy, unsafe, and potentially deadly environment for these women. Also, even though trans people make up only one of every 500 detainees in ICE detention, they account for 20 percent of confirmed sexual abuse victims in ICE facilities. 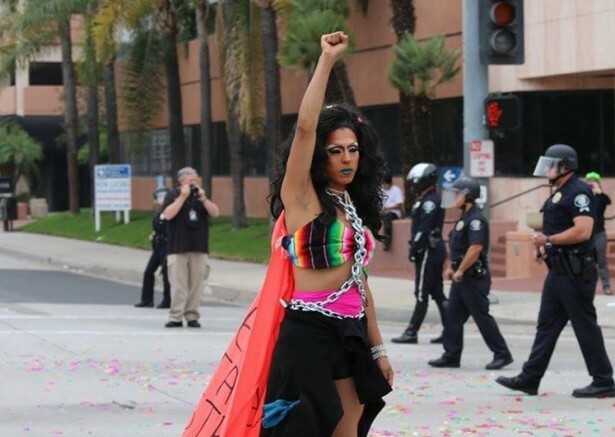 This amount of violence and abuse inflicted on trans detainees is what drove many of the protesters, like formerly detained trans leaders Karolina Lopez and Nicoll Hernandez-Polanco, out into the streets of Santa Ana. Jara-Riveros, one of the five people arrested at the protest, had also been detained more than a year ago by immigration authorities. Earlier this month, Hillary Clinton, in campaign mode, stated that she’d be open to reviewing policies that place trans women in male detention centers and put them at risk of violence and abuse. Under President Barack Obama, according to the Pew Research Center, deportations reached record highs in 2013. While the number of deportations has since declined, the fight for immigration activists will not be over until detention and deportation of immigrants comes to a complete stop.